Compare discounts for Hotels Motels Resorts in Phoenix, Arizona! At the center of 'The Valley of the Sun', Phoenix, Arizona, the sixth largest city in the US, enjoys over 300 days of sunshine each year. Golf lovers will find Phoenix to be a paradise with over 190 landscaped golf courses around the valley. Nature and sport activities are abound including mountain hiking, biking, swimming, tubing, golfing, sky diving, and boating. Phoenix offers Arizona Desert Tours for adventure lovers. Flora fans will love the Desert Botanical Gardens where you can stroll the trails between over 4,000 species of cactus, succulents, trees and flowers. Those who find interest in modern architecture should not miss Frank Lloyd Wright's Taliesin West located in Northern Scottsdale. The artistic influence of Wright is evident in the architectural features of many of Phoenix buildings. Phoenix is also a major southwestern business center and a favorite destination for corporate getaways, conventions, training seminars and board meetings. Note: Lists are not identical. 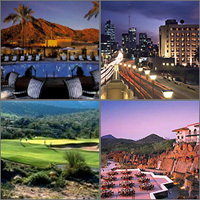 Different sites offer different accommodation options for Phoenix. The Royal Palms Hotel and Casitas is nestled at the base of Camelback Mountain between the heart of Phoenix and beautiful old town Scottsdale. The Arizona Biltmore Resort and Spa is nestled on 39 acres at the foot of the Phoenix Mountain Preserve. The JW Marriott Desert Ridge Resort and Spa, Arizona's newest and largest luxury resort, is woven into the Sonoran Desert where northeast Phoenix merges with Scottsdale. The new Marriott Phoenix Airport is conveniently located just one mile north of Sky Harbor International Airport at 44th Street and Hohokam Papago Expressways. The Phoenix Airport Hilton features 225 guest rooms with one king or two double beds; rooms can accommodate up to four guests. Pointe Hilton Squaw Peak Resort is centrally located since Squaw Peak is conveniently nestled next to a 3,000 acre desert mountain preserve; yet only four miles from downtown. Sitting astride the dramatic peaks of the Phoenix North Mountains, the Pointe Hilton Tapatio Cliffs Resort is located near the airport and the Phoenix business parks. Conveniently located four miles north of downtown Phoenix in the Camelback corridor, The Ritz-Carlton Phoenix offers business amenities in a southwestern resort setting of understated elegance. The Embassy Suites Thomas Road is located close to Phoenix Sky Harbor Airport and is near Midtown Phoenix and Tempe. Check out the many golf courses minutes from the Embassy Suites Phoenix North hotel, such as the Cave Creek Municipal Golf Course, Conocido Park, and the Moon Valley Country Club. The Embassy Suites Phoenix Airport hotel is conveniently located just 1.5 miles north of Sky Harbor International Airport and has direct access. Phoenix's sophisticated Camelback Corridor is home to sleek shops, restaurants, and the upscale, all-suite Embassy Suites Phoenix Biltmore featuring an atrium-lobby complete with Southwest-inspired murals, cascading waterfalls, and pools of iridescent Koi. Located in the business area of north Phoenix, the Four Points by Sheraton Phoenix Metrocenter features 284 guest rooms, a full-service restaurant and lounge, a fitness center and an attractive courtyard with an Olympic-sized swimming pool and whirlpool.